Two Color Choices. Reversible, Cast Aluminum Grill Plate With Non-Stick Surface. Stuff Points: Earn 110 points when you buy this stuff. The perfect way to spice up any dinner, this eight person party grill will transform ordinary meals into exciting social gatherings. Share stories over drinks as your food grills to perfection at the center of the table. Equipped with eight cooking stations, this high quality set comes complete with spatulas and raclette dishes for everyone. The cast aluminum grill plate is totally non-stick, and it's also reversible with a smooth surface on one side, and one with raised ridges on the other. Place vegetables, meats and seafood on top, and heat cheeses and other sauces down below. Once fully cooked, combine and dip for flavorful fare that anyone would enjoy. 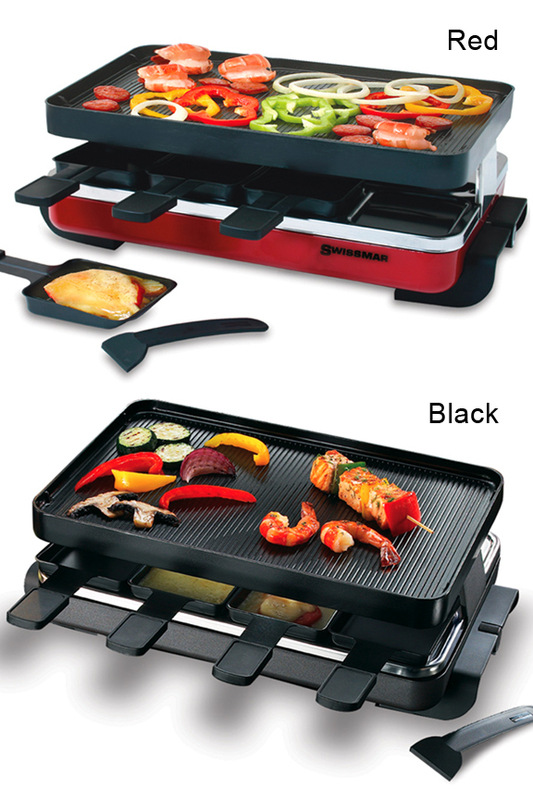 Flip the plate over, and you have the perfect surface for cooking crepes and pancakes, or grilling quesadillas. This compact and powerful indoor grill runs on electricity, and it features a variable heat control knob so you can set the perfect temperature for anything you cook. Clean up is simple thanks to the materials used, and set up is a snap, just plug it in and you're good to go. Once the 1200 watt element preheats the surface, you'll be grilling like a pro and impressing friends and family with the delicious food you prepare. (1) Electric Swiss grill with variable temperature control. 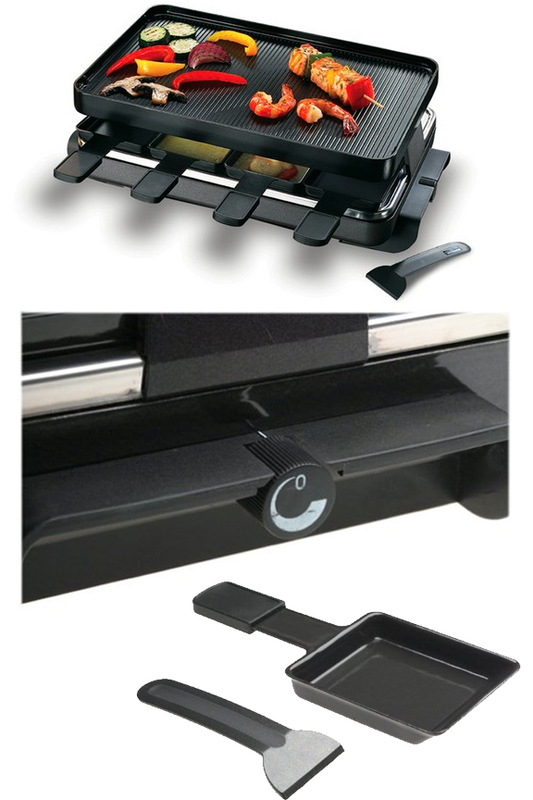 (1) Reversible non-stick grill top (cast aluminum). Swiss Engineered. Top quality components combine with superior manufacturing to give you an amazing grill that will last for years. The functionality will be flawless, and the sleek design will be a compliment to any dinning room or kitchen. Reversible. 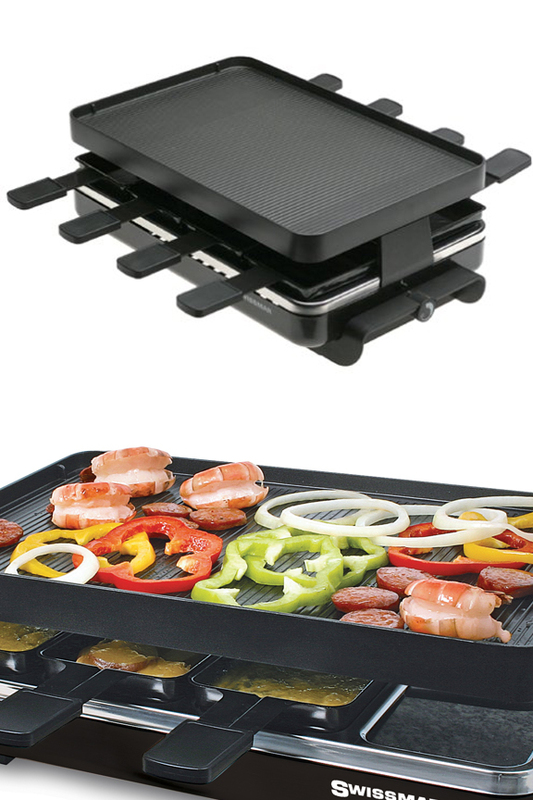 With a double sided grill plate you'll find more uses for this appliance when compared to other options. One side has 1/4" grill lines that run vertically across the face, and the other side is smooth with two large, circular targets for making crepes. Large. With plenty of room on top, and enough dishes below to accommodate eight diners, this is a good size party grill, but not so large that you will feel silly using it with less people involved. Cook a meal for your family of four, or use it at your next dinner party to feed everyone. Complete Set. Everything you need will be inside the box, so you can start using it right away. 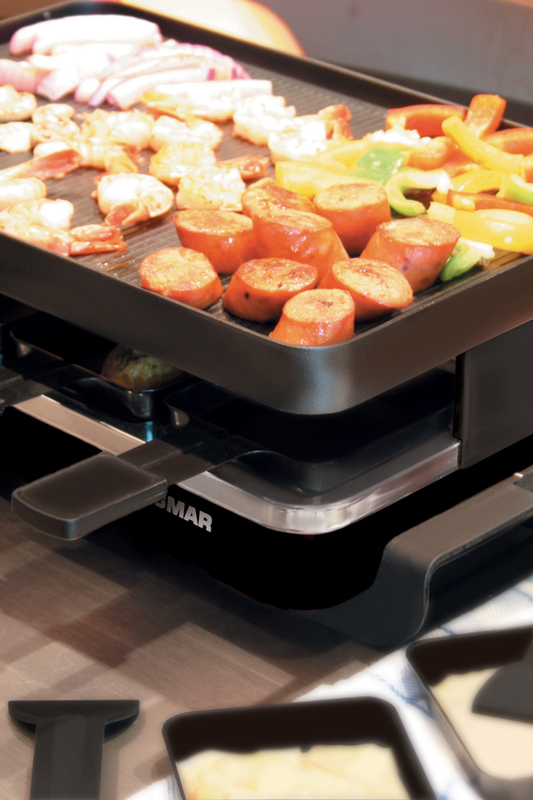 It comes complete with the electric grill base, aluminum grill plate, 8 raclette dishes with heat resistant handles, and 8 spatulas for flipping and serving. Versatile. Use one side for grilling meats, seafood and vegetables, or turn it over to take advantage of the smooth side for pancakes, crepes and other foods. It comes equipped with a cast aluminum plate, but you can also get a granite or cast iron one to use instead. Cast Aluminum. To ensure even heating and precise temperatures, but also provide a durable, non-stick surface, the grill pate is made from cast aluminum. It's lighter than cast iron, so it's easier to clean, and when cooking, its performance will be similar. Adjustable. Many competing models are only on or off, with no temperature range to choose from. This one features a convenient knob so you can select from a wide range of temperature settings, and leave it on the one that's best for what you're cooking. 1 Year Warranty. High quality constructions ensures a long life, but an added warranty from the manufacturer gives you piece of mind, and protection against manufacturing defects. Prefer one with a different cooking surface? Check out the cast iron version. It's identical to this one, but it comes with a cast iron plate instead of aluminum. It does cost a little bit more, but the heavier material may be preferred by some people. Dimensions 17" x 11" x 6"
Grill Dimensions 14.25" x 9.25" x .25"
Uses Grill meats and veggies on top, and melt cheese or heat sauces underneath. Also great for fajitas, crepes, pancakes and more. Compatibility Use with up to 8 people. 8 cooking stations total. Color Your Choice. Black or Red. Reversible Grill Plate Yes. Smooth on one side, and grill lines on the other. Raclette Dishes Included Yes. 8 Included. Spatulas Included Yes. 8 Included. Adjustable Heat Yes. Variable heat control allows you to set the perfect cooking temperature. The perfect accessory for your next dinner party, this grill makes cooking and eating a social activity. 8 cooking stations allow a whole group to cook meat and veggies on top while cheese and other sauces broil to perfection down below. Order Yours Today! Works great. Enjoyed the food that we made with it. A 12" Long Food Turner For Quick and Easy Flipping. High Quality Brushes for Baking, Roasting, Frying and Grilling. An Indoor, Barbecue Grill for Your Stove. Works On Gas Or Electric Ranges! The 19" Pig Tail Food Turner. The Ultimate Grilling Utensil. A Handy Tool For Any Chef. Spatula, Whisk, Tongs And Strainer In One! A Family Size Grilling Plank With The Perfect Amount Of Moisture Already Added.